• 30.3 million Americans have diabetes (9% of the US population). • 84.1 million Americans have pre-diabetes, a condition that if not treated often leads to type 2 diabetes within five years. • Every 23 seconds someone in the U.S. is diagnosed and another person faces terrible, life-threatening complications. • 15% of people with diabetes are likely to suffer foot ulceration (3.6 million). 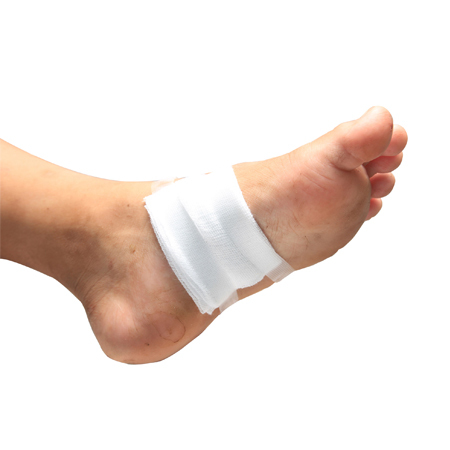 • Foot ulcers contribute to 85% of diabetes related amputations. • Over 80,000 lower extremity amputations are related to diabetes each year. • Proper foot care can reduce amputations by 45-85%. • Diabetes is the 7th leading cause of death. • Pressure calluses; cuts and scratches; blisters; corns; collapsed arches; thinning heel pads; bunions; etc. ✔ Check your feet daily. Look for red spots, cuts, swelling, and blisters. If you cannot see the bottoms of your feet, use a mirror or ask someone for help. ✔ Increase physical activity. Plan your physical activity program with your health team. ✔ Wash your feet daily. Dry them carefully, especially between your toes. ✔ Keep your skin soft and smooth. Rub a thin coat of skin lotion over the tops and bottoms of your feet, but not between your toes. ✔ Trim your toenails straight across and file the edges with a nail file. ✔ Wear shoes and socks at all times. Never walk barefoot. Wear comfortable shoes that fit well and protect your feet. ✔ Your socks should be made from soft, moisture control yarns that are lightly padded with seamless toe seams. ✔ Check inside your shoes. Make sure the lining is smooth and there are no objects inside. ✔ Keep the blood flowing to your feet. Prop your feet up when sitting. Wiggle your toes up and down during the day. ✔ Wear your socks at night. ✔ Don’t smoke. Smoking can restrict the blood flow to your feet. ✔ Take care of your diabetes. Work with your health care team to keep your blood glucose in your target area.